So the controversy begins – what really is Picante Sauce? 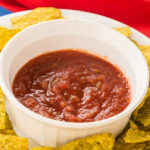 Picante Salsa – aka Salsa Rojo served with tortilla chips. Ask 10 people this question and you will likely get 10 different answers. That is because salsa comes in all sorts of textures with a variety of flavors. And what it is called depends on where you live. For us, we wanted to replicate the type of sauce that you find at Mexican restaurants. It is much thinner than classic American salsa that is found in the jars at the grocery store. 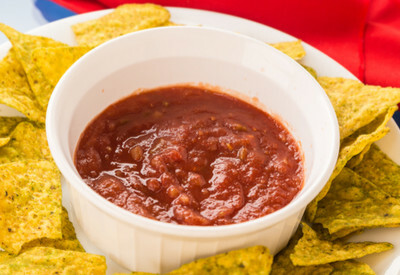 Although Mexixcan restaurants refer to it as chips and salsa, it is also called salsa roja or salsa de mesa. Salsa roja means red sauce and salsa de mesa translates to table sauce. The actual sauce is made from a blend of fresh plum tomatoes, onions, cilantro and serrano peppers. Shockingly there is no lime juice in authentic picante sauce. However, knowing that we wanted to preserve the picante sauce through the canning process, we knew that we would have to keep some acid in the recipe. 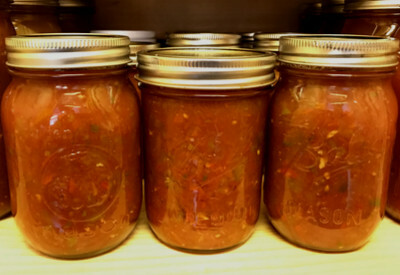 We kept the proportions of tomatoes to peppers the same as approved salsa canning recipes. However, we substituted some green peppers for hot peppers to make the taste more authentic. 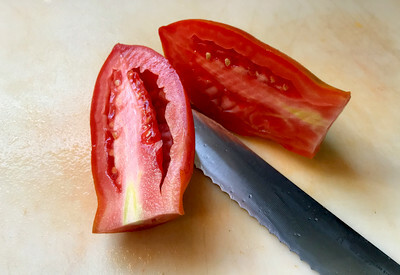 Paste tomatoes such as this Roma variety make great picante salsa. And in order to achieve the thin consistency of picante sauce, we did three things. First we used our Roma Tomato Strainer to peel, remove the seeds, and leave us with a combination of tomato juice and tomato pulp. Not only was the consistency thinner, it saved us a ton of time by not having to individually peel each tomato. However, this recipe can definitely be made that way. We also used our Hamilton Beach Duo Food Processor to grind down the peppers and onions. We didn’t want big chunks, just tiny bits of peppers and onions spread throughout the sauce. Again, a HUGE time saver from dicing them with a knife. And finally, we used our Immersion blender to grind down the sauce as it was heating up. This allowed us to achieve the desired consistency as we watched it cook down in the pot. **There is a printable recipe for Picante Salsa located at the bottom of this page. Stop working so hard to dice your onions and peppers. 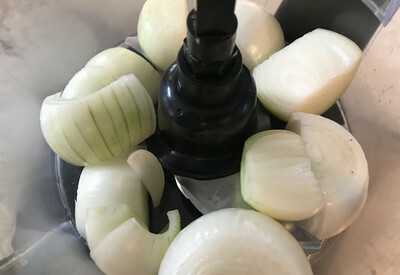 Use a food processor – well worth the investment! *If you have a Tomato Strainer, proceed to step 2. 1. Peel tomatoes and remove the seeds. Dice the tomatoes and put them in a large stockpot over medium-high heat. Bring to a boil and mash down the tomatoes as they become soft. Canned jars of picante salsa – stored in a cool dark space. 2. If you have a tomato strainer, wash, core and dice tomatoes and place them in a large stockpot. Heat the tomatoes over medium-high heat until they begin to boil. Simmer for 5-10 minutes. Place heated tomatoes into a tomato strainer with the salsa screen. Discard the skin/seeds and place the remaining tomato pulp back into the large stockpot. 3. Dice your green, red, jalapeno peppers and onions. Using a food processor will save you a lot of time and effort. Add the diced mixture to the pot. 4. Mince 8 cloves of garlic and add to the tomato mixture. 5. Add the remaining ingredients and stir well. 6. Bring to a simmer and heat for approximately 30 minutes. Use an immersion blender to get the mixture to your desired consistency. 7. Sterilize pint jars and heat lids. 8. Pour picante mixture in hot jars, wipe the rim, apply the lid and band and place in canner. 9. Pressure can for 15 minutes with 10 pounds of pressure or Hot water bath for 35 minutes. *Adjust for altitude accordingly. 10. Remove from canner and let sit for 12-24 hours until completely cool. Check to make sure the jars have sealed appropriately. Store in a cool dark place. A thin consistency salsa recipe that is similar to what is served at Mexican restaurants. Peel tomatoes and remove the seeds. Dice the tomatoes and put them in a large stockpot over medium-high heat. Bring to a boil and mash down the tomatoes as they become soft. If you have a tomato strainer, wash, core and dice tomatoes and place them in a large stockpot. Heat the tomatoes over medium-high heat until they begin to boil. Simmer for 5-10 minutes. Place heated tomatoes into a tomato strainer with the salsa screen. Discard the skin/seeds and place the remaining tomato pulp back into the large stockpot. Dice your green, red, jalapeno peppers and onions. Using a food processor will save you a lot of time and effort. Add the diced mixture to the pot. Mince 8 cloves of garlic and add to the tomato mixture. Bring to a simmer and heat for approximately 30 minutes. Use an immersion blender to get the mixture to your desired consistency. Sterilize pint jars and heat lids. Pour picante mixture in hot jars, wipe the rim, apply the lid and band and place in canner. Pressure can for 15 minutes with 10 pounds of pressure or Hot water bath for 35 minutes. *Adjust for altitude accordingly. Remove from canner and let sit for 12-24 hours until completely cool. Check to make sure the jars have sealed appropriately. Store in a cool dark place. ← An Incredible Record Setting Harvest – Raised Row Garden Magic! Thank you! Because it is a thinner sauce, I would think that freezing it would work too! Sorry for the confusion, it is the juice of two limes. Do you chop the limes and add? Or is it the juice from 2 limes? You have some great recipes! I was wondering, would this work if you froze the sauce instead of canning it?